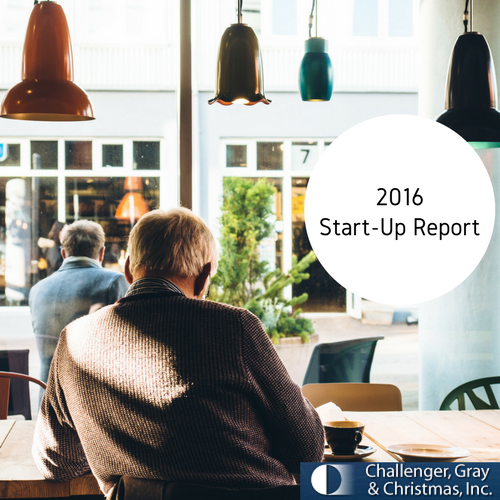 More Job Seekers Chose Entrepreneurship in 2016 | Challenger, Gray & Christmas, Inc.
An average of 7.4 percent of job seekers started a business in the fourth quarter. 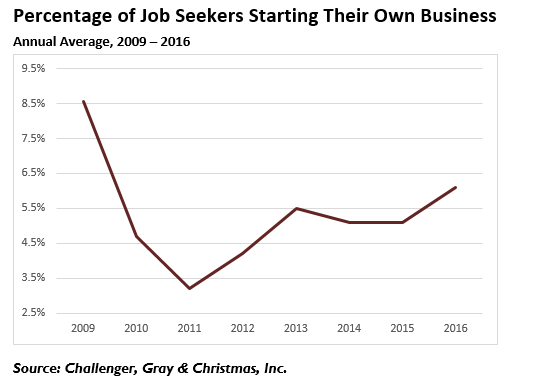 That was the highest quarterly average since the fourth quarter of 2013, when 8.6 percent of job seekers started a business, according to the latest job search statistics from global outplacement and coaching consultancy Challenger, Gray & Christmas, Inc. 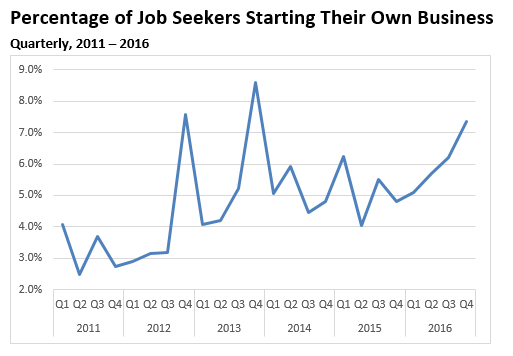 The fourth quarter start-up rate was significantly higher than the same period in 2015, when just 4.8 percent of job seekers opted for entrepreneurship. The start-up rate ticked up steadily throughout 2016. In the first two quarters of the year, the start-up rates were 5.1 percent and 5.7 percent, respectively. By the third quarter, the rate increased to 6.2 percent. The annual start-up rate in 2016 was 6.1 percent, the highest annual average since 8.6 percent of job seekers started their own businesses in 2009. “We tend to see an increase in start-up activity when confidence is high. And, right now, fledgling entrepreneurs are confident, not only about the chances of their business venture succeeding, but also about their chances of finding traditional employment if the venture should fail,” said John A. Challenger, chief executive officer of Challenger, Gray & Christmas. The latest data from the U.S. Bureau of Labor Statistics shows that 227,000 net new jobs were created in January. Overall, nearly 5.3 million Americans were hired during the month, and there were still more than 5.5 million unfilled job openings at the end of last month. “Knowing that the job market is strong provides a mental safety net for would-be entrepreneurs. These individuals are also benefitting from the availability of relatively cheap money. Despite the Fed’s quarter-percentage increase in December, interest rates remain low and start-up capital is accessible,” said Challenger. A somewhat broader measure of American entrepreneurship can be seen in the Bureau of Labor Statistics data on self-employment, which also increased during the economy’s recent upswing. According to the BLS, the number of self-employed workers has grown by nearly 150,000 since 2014, going from 8,602,000 to 8,751,000, as of the close of 2016. “Going forward, start-up activity could be influenced by the fact that we now have a president who is a proponent of deregulation. While most start-ups fall below the employment threshold where government regulations have a significant impact, the pro-business environment may still encourage more risk-taking among would-be entrepreneurs,” said Challenger. For entrepreneurs starting larger operations, President Trump’s proposals to repeal and replace the Affordable Care Act and its provisions to provide health coverage to employees, tax reform that would lower corporate rates, along with additional labor deregulation similar to the halt of the Department of Labor’s Overtime Rule are potential boons for small businesses. Start-up activity continues to be dominated by older, more seasoned workers. According to Challenger data, 85.7 percent of those who started new businesses were over 40. In 2015, the self-employment rate for workers 65 and older was 15.5 percent, much higher than the 1.9 percent for counterparts aged 16 to 24, and higher than the average rate for ages 45 to 64, which stood below 10 percent, according to the latest Bureau of Labor Statistics Data. “The gig economy and the trend for companies to hire independent contractors over salaried, full-time staff is likely adding to this increase in entrepreneurial activity. In addition, older workers who retire find themselves taking on consulting work or embarking on new projects,” added Challenger.